We had so much Salmon from that Cedar Plank Grilled Salmon that there were a ton of leftovers. What’s a girl to do with leftover Salmon? You guessed it! Salmon Burgers. These were not only really easy to make, they were quick to cook up, and they were super tasty! 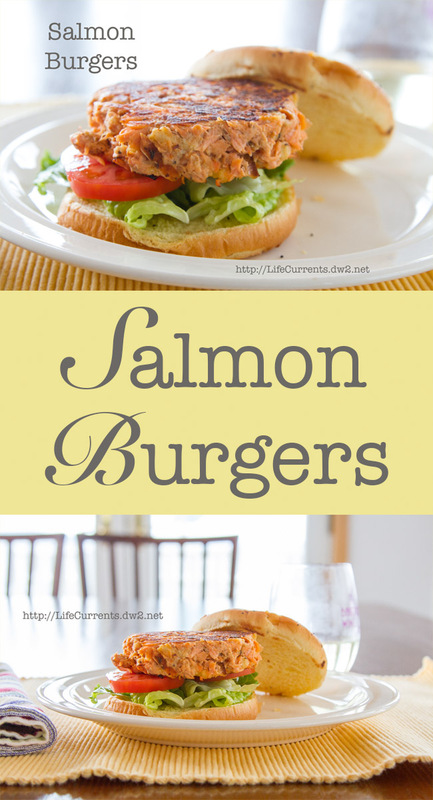 These Salmon Burgers were so juicy and moist that they didn’t need any mayo on the bun. We topped them pretty simply with lettuce and fresh garden tomatoes (again, thanks Mary!!). But, the real kicker on these burgers was the drizzle of Sweet and Soy Dressing that we put over the top. It made a juicy delish burger sing to perfection. Then, all that yumminess was placed on a toasted onion bun. Just oh so yummy! The perfect Pacific Northwest dinner! I highly recommend my Sweet and Soy Dressing on these Salmon Burgers. It was awesome! All ingredients in the bowl ready to be mixed. You can see the spices from Potlach Spices on the Salmon. Yum! Mixture is formed into patties and ready to go into the fridge to rest. Be sure not to pack patties too tightly or they won’t cook well. Place the Grilled Salmon in a medium bowl, and lightly break up any large chunks, making sure to remove any bones in the fish. Add the sour cream and egg to the salmon. Place sourdough bread in a toaster and toast until golden. Once toasted, crumble the bread into small pieces into the medium bowl with the salmon. Add the Worcestershire and Old Bay, and gently mix together, being careful not to over mix; you just want them combined and the very large chunks broken up. Using your hands, lightly scoop the salmon mixture and form 4 patties, about 1 ½ inches thick. Place patties on a foil or parchment lined tray, cover, and place in the refrigerator for 30 to 60 minutes to rest. Once the salmon patties have rested, heat a small amount of oil to a large skillet set over medium-high heat, until hot and shimmering. Add the salmon patties, being careful not to overcrowd the pan, and cook until golden brown and heated through, about 3 minutes per side. Place the cooked Salmon Burger on a hamburger bun and top with your favorite toppings. I highly recommend my Sweet and Soy Dressing on these Salmon Burgers. It was awesome! Make Ahead: The Salmon Patties can be mixed, formed, and refrigerated overnight. I love ‘leftover makeovers’ like this! Your salmon burgers look so delicious! I love salmon and these look so good! We don’t eat seafood in our house, but I know a bunch of people that would LOVE these!! Oh man they sound so moist! This is almost like a salmon meatloaf as a burger! I love salmon and this is a perfect way to use up any leftovers (if they’re not consumed first)! That looks delicious! I making awesome things with leftovers! That looks so good. I love salmon and never had it in a burger. Looks great! Sharing with my MIL! If I have salmon, there won’t be able left overs lol. It’s one of my favorite fishes but I now I know what to do next time if ever I have a left over. G’day! Your salmon burgers does look indeed healthy! Your salmon burgers look incredibly tasty. Love them! I love Trader Joes salmon burgers! Though I bet it would be better for me to make them myself! These are one of my favorite midnight meals. It’s healthy so I don’t feel the guilty and super delicious. These look beautiful and amazing! This is the perfect meal for me, I’ll be saving this in my recipe book. These look so good. I love salmon and I haven’t had a salmon burger in eons. I can’t wait to try this out! Thank you so much for sharing it with us at Foodie Fridays! Nice! My mom used to make salmon burgers back in the day, so they have a big place in my heart. Love the flavours going on in here. I think you’ve built a better burger! My family and I love salmon! These burgers are just the perfect Sunday meal!